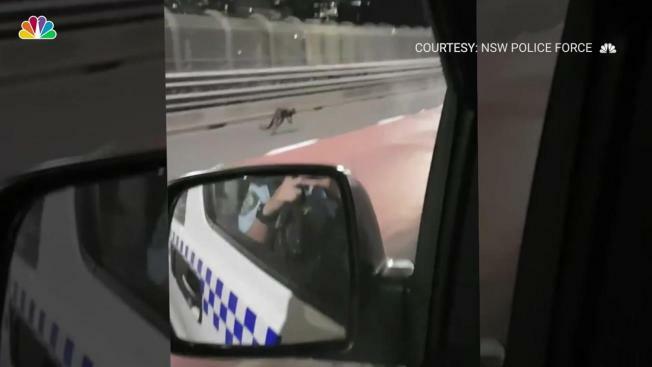 A wallaby led Australian police on a hilarious chase down a highway that was all captured on video this week. The New South Wales Police Force posted the clip to Facebook of the runaway marsupial speeding down the road, with the cops in 'hop' pursuit. "Even the All Blacks wouldn't have caught this Wallaby making a break," the post read, referring to the long-running rivalry between New Zealand and Australia's national rugby teams. The police joked that the animals at the local zoo were now being questioned for allowing the jumping marsupial to 'skip town'. 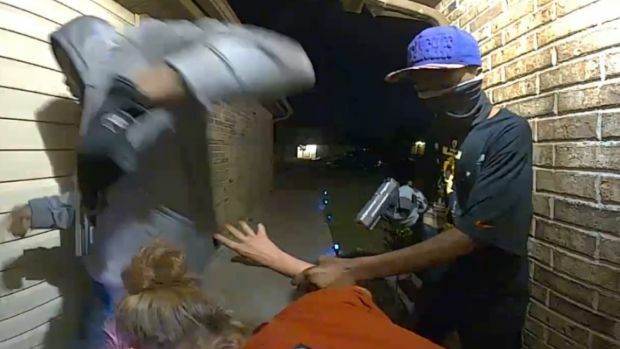 Security video shows robbers who had been holding a Texas woman at gunpoint at her own door run away when the victim's four barking dogs rush to her rescue. See more crazy animal stories in photos. In the video the wallaby is seen bounding down the left lane of the highway, illuminated by the cop car's siren. When it finally stops, an officer approaches it slowly, but as soon as he gets near the wallaby takes off again. The police officers shooting the video can be heard giggling in the background. While the wallaby may have come from the zoo, wallabies are native to Australia and also live in the wild.